After the sensational success of Scrolling News Update Headline Tickerfor Blogger and due to the large number of requests we received from our loyal readers, we are so delighted to present you the fresh and enhanced version of headline ticker which is enhanced with RSS Feeds so we don’t need to update our ticker again and again, which means it will update automatically with the help of RSS Feeds. Getting our readers up to date is the most significant task for a blogger but due to stretched (tuff) schedule most of blogger are unable to notify their visitors with their latest Featured posts. This is the reason why we have coded a brand new Headline Ticker which will update automatically, so we can sit back and enjoy a cup of tea while our ticker updates on automation. I know you would love to Preview the widget so before we proceed to our tutorial, let us look at the live demo of this widget. 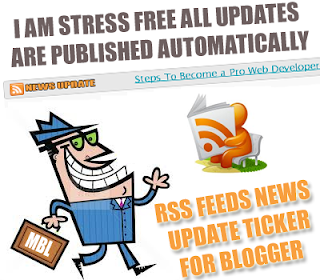 To insert MBL RSS Feed Headline ticker in blogger blog follow these steps. Step# 4: Then Search for the following code in the template. Step# 5: When You Found ]]></b:skin> just above it paste the following code. Step# 4: After customizing Save the Widget by pressing Save button. And now visit your blog and it will be a photo finish. So that's how you can insert Animated Rss Feed Ticker in Blogger blogspot blogs. This Widget will not only improve your traffic but it will also make your blog look more attractive. If you face any difficulty while adding this widget feel free to ask till then peace, blessings and happy ticking. Worked great, thanks a bunch! Good tutorial. Any idea how to use the effect to make a twitter ticker? Thanks For Liking it Bro its very Simply Just Follow the same Steps But Instead Of Your Website FEED Insert Your Twitter Feed. To do so First Burn Your Twitter Feed by going to Feedburner.com And Insert its URL by following same steps. And it will become a RSS FEED Automatically Tweet Ticker. Don't worry soon we will share complete tutorial on it Peace Buddy. Thanks for the fast response. But actually I want the text (the tweets) can move across the screen horizontally, from left to right.. I hope you will find it. For sure, i will check out your blog regularly because they are useful. XML error message: The reference to entity "callback" must end with the ';' delimiter. XML error message: The entity "callback" was referenced, but not declared. Its not working bro, why ?